Farkhunda’s brutal murder in March had reverberations inside and outside of Afghanistan as people around the world called for justice for an innocent girl. Many people demanded a public trial for her killers and some called for them to be hanged in public where the young woman was tortured and killed by a mob. Over the six weeks of investigation, police used videos of the mob attack to identify and arrest 49 people, including 16 police officers. General Zahir Zahir, the chief of police of Kabul, stated that powerful people who supported some of the killers tried to get them released. But finally the day came on Saturday, May 2 when the Kabul Primary Court took up the case with the 49 accused men presented before us and the media. The prosecutor delivered the details of each case with witnesses. Then each defendant was given the chance to speak in his defense. They described their innocence. Several put the blame for the killing on the Mullah Zainuddin—the religious leader of the mosque who provoked the mob to attack Farkhunda by claiming the 27-year-old girl had burned the Qur’an. It was a lie. The investigation found she had done no such thing; she was a religious scholar herself. The police officers accused of neglecting their duty to save Farkhunda from the attack defended themselves by saying it was the chief of police who remained silent even when they informed him what was happening. They said he ignored their reports. During the trial the case took a strange diversion when it was rumored that a Saudi Arabian man had been arrested at the site of the murder that day, but was later released by the chief of police. In court, the police chief claimed that the man was Afghan and was innocent of participating in the crime. The man then presented his own defense, saying he has an Afghan mother and an Arab father and although his brothers and sisters had foreign passports, he did not. When asked what he was doing in Afghanistan, he told the judge he had gotten in trouble with Saudi police and came to Afghanistan. He presented an expired passport and he did not speak Dari. Finally, the judge ordered him to jail and released the chief of police. On the fifth day of the trial, May 6, the court announced verdicts for 30 of the 49 defendants. Four men were sentenced to death. Eight men were sentenced to 16-year prison terms. Eighteen men were found innocent and freed. Finally, Judge Safiullah Mojadedi ordered police to go back and arrest three men who he found were the leaders in the mob killing. The rest of the people charged—mainly the police officers—were not convicted, but it was not announced what the judge planned to do. The charges varied from assault and murder to encouraging violence. I believe this trial has raised many questions. Why did the judge not ask the chief of police why he had forced Farkhunda’s mother to appear on media and say that her daughter was mentally ill, and then he made them leave Kabul? Why were 18 men set free and called innocent when there are so many videos showing these men involved in the attacks on Farkhunda? Police had arrested these men because they were identified in the videos as participating in the killing. And how does a foreign criminal being pursued by the police of his own country get entry to Afghanistan? The only answers that come to mind are that there is widespread corruption in the court. 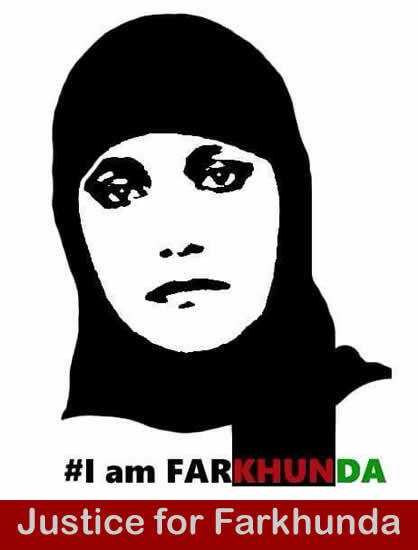 I fear that the real leaders in the murder of Farkhunda will never be tried. What courage and insight you have, Sitara! Thank you for sharing this important piece of writing with the world. Thank you, Sitara, for the sharp analysis — your voice is clear and strong. This blog is one of the only places in the world where the thoughts and reactions of Afghan women can be “heard,” so we are grateful for the insights that you and your colleagues share with us. Keep writing! Thank you for sharing the truth, we don’t get that in the media here.